Deciding on a major purchase like buying a new car can be daunting. Where do you begin, especially if you’re making the leap to the luxury car life? There are so many choices it will make your head spin and prices range from about $40,000 to $50,000 and to more than $300,000 for an ultra-luxury vehicle. Begin with the basics: What can you afford and how much do you want to pay? Cost will help narrow down the choices significantly and provide you with a place to start. Now that you know what you can afford, you can go online to find out what kinds of cars fall into your price range. You can check out automotive standards such as Kelley Blue Book (www.kbb.com) for basic advice and value on cars, Consumer Reports (www.consumerreports.org) for great info on safety features and crash test ratings, or individual sites such as From Car to Finish (www.fromcartofinish.com) for help in comparing and contrasting all of those features that can be mind-boggling at best. Now that you know what you can afford and where to look, you’ll need to determine how you plan to use your vehicle. Are you carting around toddlers and all of their gear, or just yourself? Are you looking for fun and fast, or do you want roomy and dependable? Determining your lifestyle and how the car should fulfill your needs will help you narrow the field further. 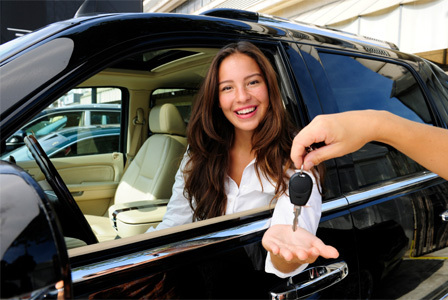 Read “What type of car fits your lifestyle?” for help in determining your best car choice. Now that you know what you can afford and what’s going to work for your lifestyle, you can pick the car you like. Depending on how you buy your car—based on aesthetics, brand, practicality, safety, or handling—start looking for the style, make, brand, and features that appeal to you. Make a list of your must-haves. For some help in this arena, check out the article, “10 Car Features You Don’t Want to Be Without,” for suggestions. Now that you have a list of 3 to 5 of your favorite cars, it’s time to put them through the paces. The only way for you to do that is to test drive them. As Mike Rabkin, president of From Car to Finish, a nationwide, online-based car negotiation service, says, “Buying a car is not like buying a toothbrush, you can’t throw it out if you don’t like it.” That being said, you want to take your time and try it before you buy it. So you know what you can afford; the car that fits your lifestyle; and the one you like to look at, be in, and drive. Now it’s time to buy. This is the part that might not be much fun. When it comes down to it, you have to go to the dealership and haggle with the salesman to get that car you’re now in love with for a price you can stomach. To prepare yourself for this ordeal, go back to the websites you used to do your research. They’ll provide you with tips, suggestions, and information about negotiating and financing. You can talk to friends, colleagues, and family members to find out where they had a good experience buying their last luxury vehicle, or you can hire someone to negotiate on your behalf. Companies like Rabkin’s From Car to Finish can haggle on your behalf, saving you time, money, and a whole lot of stress.